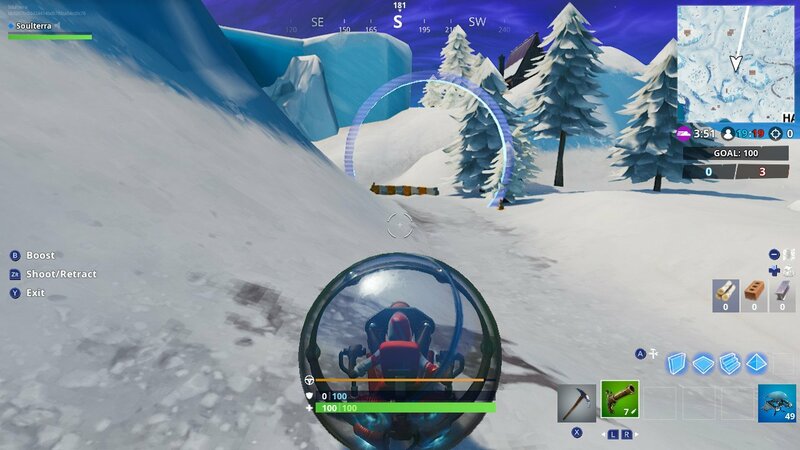 As we reach week 5 and the halfway point of season 8 in Fortnite: Battle Royale, we face a challenge that tasks us with traveling to Happy Hamlet and completing a lap around the race track there. Many players may not have known there’s a race track in Happy Hamlet — we sure didn’t — but there is and we’re going to help you find out where it is and complete the lap around it. 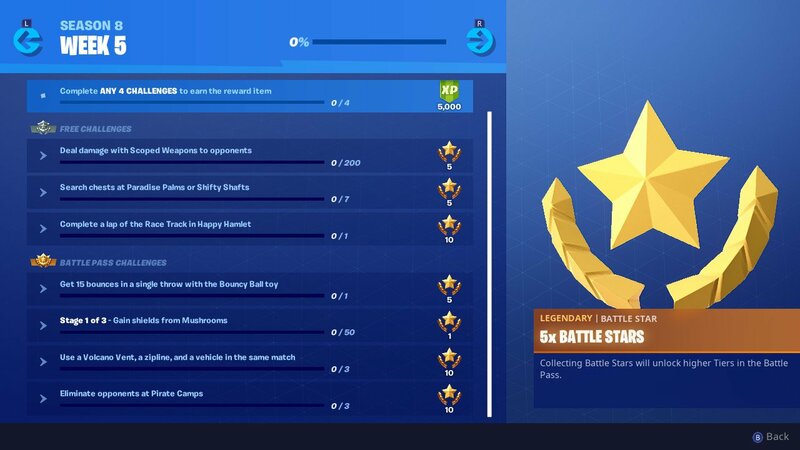 You’ll definitely want to, as the reward for completing this relatively easy challenge is a whopping 10 Battle Stars. What are you waiting for? Let’s race to it! We have a group of seven new challenges for players to take on this week. As always, four of these challenges are available only to Battle Pass owners (we hope you did your overtime challenges last season) while the other three are available to all players regardless of a season pass. Unfortunately, this week is pretty lame. It’s mostly stuff we’ve seen before as well as some newer challenges that aren’t really that challenging at all. 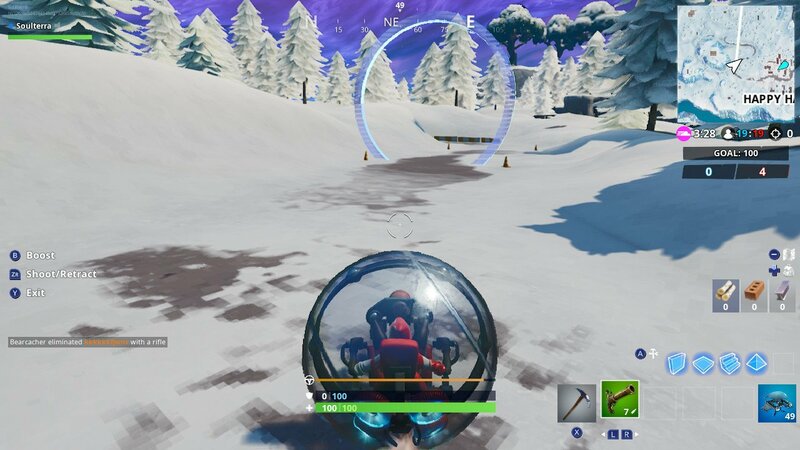 Thankfully, the race track in Happy Hamlet challenge gives you an excuse to utilize the awesome Baller vehicle and the bouncy ball toy. This season eight, week five challenge tasks you with heading to a specific race track in Happy Hamlet and completing a single lap around it. For this challenge, we recommend completing it in the Team Rumble limited time mode, which seems to be a permanent staple at this point. That’s the big team mode available right now but if it isn’t available in the future for you, just pick whichever 50 versus 50 or large team mode that’s currently available. 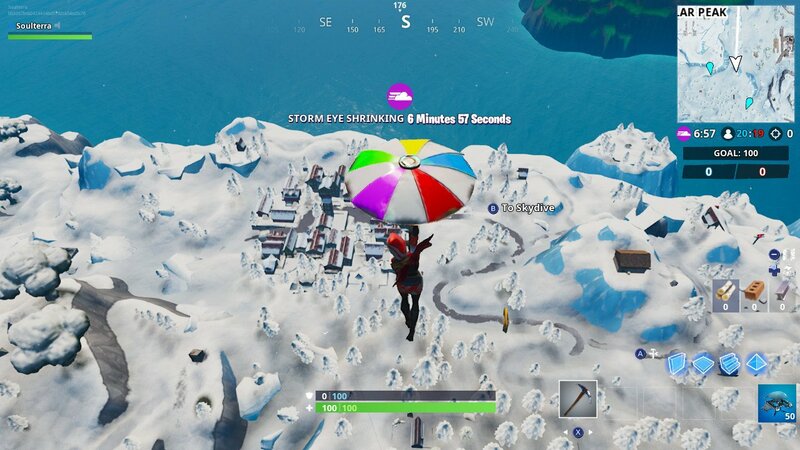 It’s worth noting that neither Playgrounds nor Creative mode will net you the rewards for this season eight, week five challenge so don’t waste your time trying to complete it in those. It shouldn’t take you but one single match to finish it. But in order to finish it, you’ll need to know where to go. Before we can complete this challenge and get its sweet reward, we need to find where the race track in Happy Hamlet is. Thankfully, the title of the challenge points us in the direction of the general location you need to head unlike the extremely vague challenge description for the magnifying glass challenge a couple of weeks ago. Many players might be surprised to know that there is a race track in Happy Hamlet as we didn’t even know that in all honesty. However, it’s important to note that the title of this season eight, week five challenge is a little misleading. If you try to do this challenge on your own without a guide, you may find yourself wandering around for an entire match aimlessly. 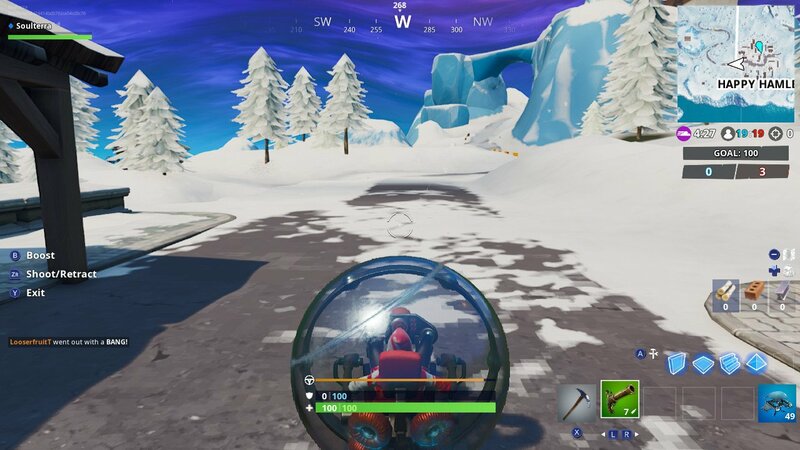 That’s because, while Epic Games calls it the Happy Hamlet race track, it’s not actually located within the location itself. 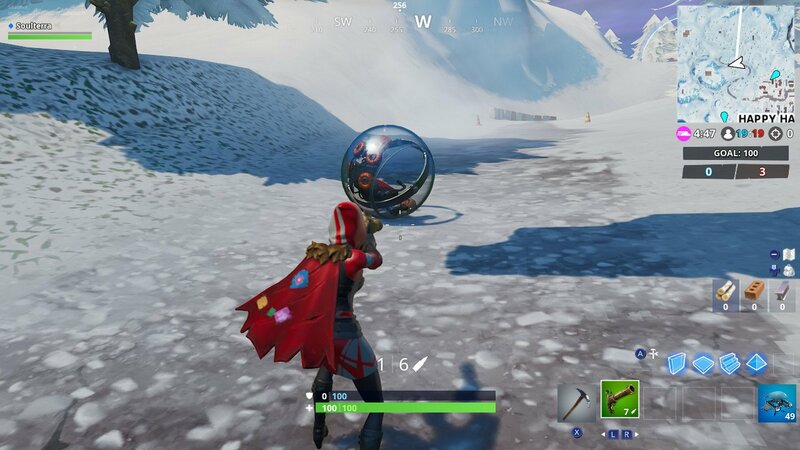 Happy Hamlet, for those of you who don’t know, is a newer location that was added to the map last season when the iceberg crashed into the island at the onset of season seven. 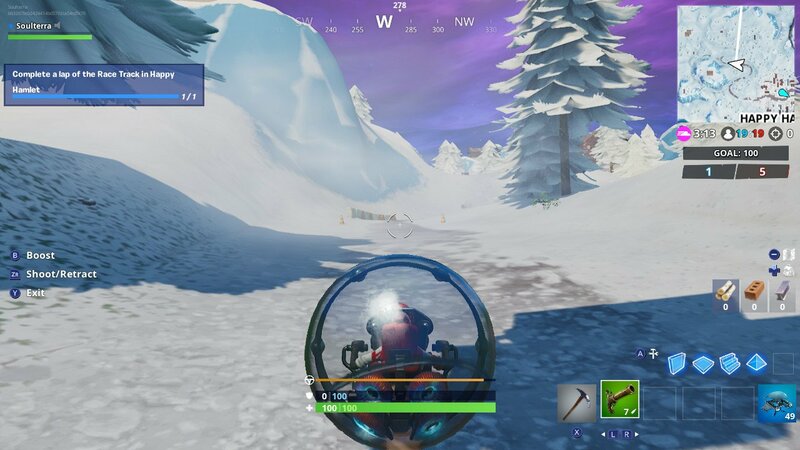 Happy Hamlet is located right near the bottom of the map in the snowy southwestern quadrant of the map, kind of where Flush Factory once was. However, just reaching the adorable little town isn’t all you need to do. Once you have reached Happy Hamlet, head directly west of the cute town. If you look on your map, directly next to the town on its left side, there is a backward “S” shape on the ground. It’s pretty thin and transparent so it can be hard to see. This is where the Happy Hamlet race track is. Your best bet is to head through the western exit in Happy Hamlet. Follow the main road and it will curve around, leading you to a large race track board at the top with numbers and all sorts of stuff. Don’t worry if you don’t have a driftboard or golf cart as there are typically four Baller vehicles waiting here at the start of the racetrack. Now it’s time for the fun part. Hop into your Baller vehicle or driftboard or whatever vehicle you want, and get ready. Once you pass through the starting race track sign, you will be starting your race. As we mentioned, though, this is a very casual race around the track so don’t worry about your time or if you veer off of the racetrack at any point. Once you start, follow the road in front of you and you will quickly see a blue glowing ring appear around the track. This is your checkpoint for the lap around the track and you need to pass through (or touch) all of the glowing rings in order to complete the Happy Hamet race track this challenge. You can do this as fast or as slow and methodical as you want. The rings are also really forgiving, too, as we are certain there is one ring that we didn’t really touch or pass directly through but it still counted anyway. 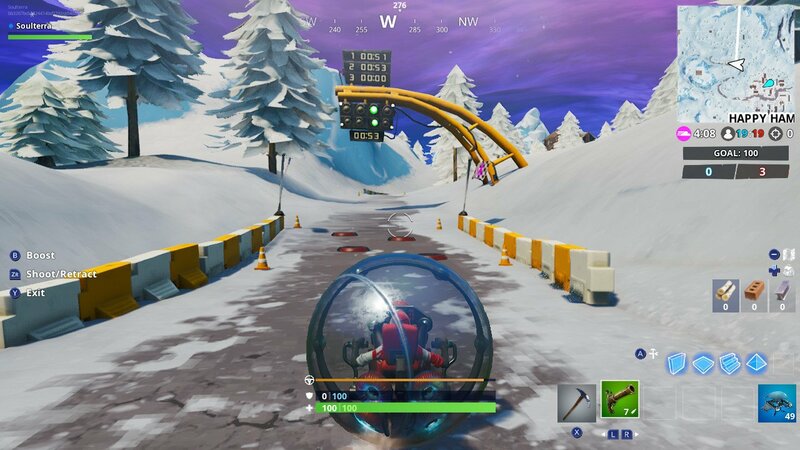 There are just a handful of checkpoint rings that you need to go through, and they will take you all the way around the track and back to the start. There is one ring that you may have some trouble with. At one point, there is a ring that is in the middle of the air. Which means that you will need to either leap through it with the Baller or just barely touch the glowing ring. It is absolutely possible with the Baller but you will need to utilize the retractable suction cup in order to successfully accomplish this. We recommend just playing around with the thing, shooting it out and then boosting to jump upward and try to touch or pass through this checkpoint. If you’re really having trouble completing this part, you can always turn on party assist for this challenge in the challenges tab of the home menu and your teammates can help you complete the challenge. Once you’ve gotten this checkpoint, the rest is super easy to complete. Your reward for completing the race track in Happy Hamlet is a pretty good one for a rather simple and easy challenge. You get a whopping 10 Battle Stars, which is enough to guarantee an entire tier level up.